The Fontana Flyer is the quarterly newsletter for the Fontana Regional Library system. This award winning publication provides information about services, events, and programs at all of the libraries in our system, as well as news developments that affect the interests of library users and the public. ▸Read the latest Fontana Flyer (pdf). Would you rather… Duel Dumbledore or Voldemort? 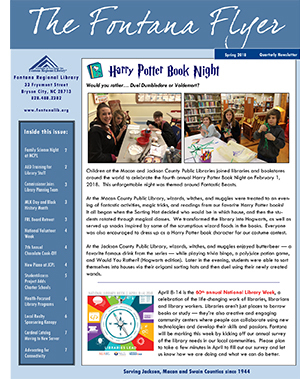 Children at the Macon and Jackson County Public Libraries joined libraries and bookstores around the world to celebrate the fourth annual Harry Potter Book Night on February 1, 2018. This unforgettable night was themed around Fantastic Beasts. At the Macon County Public Library, wizards, witches, and muggles were treated to an evening of fantastic activities, magic tricks, and readings from our favorite Harry Potter books! It all began when the Sorting Hat decided who would be in which house, and then the students rotated through magical classes. We transformed the library into Hogwarts, as well as served up snacks inspired by some of the scrumptious wizard foods in the books. Everyone was also encouraged to dress up as a Harry Potter book character for our costume contest. At the Jackson County Public Library, wizards, witches, and muggles enjoyed butterbeer — a favorite famous drink from the series — while playing trivia bingo, a polyjuice potion game, and Would You Rather? (Hogwarts edition). Later in the evening, students were able to sort themselves into houses via their origami sorting hats and then duel using their newly created wands. April 8-14 is the 60th annual National Library Week, a celebration of the life-changing work of libraries, librarians and library workers. Libraries aren’t just places to borrow books or study — they’re also creative and engaging community centers where people can collaborate using new technologies and develop their skills and passions. Fontana will be marking this week by kicking off our annual survey of the library needs in our local communities. Please plan to take a few minutes in April to fill out our survey and let us know how we are doing and what we can do better. Macon County Public Library will present Family Science Night: The Science of Food and Drink on Thursday, April 12th from 5:30 - 7PM. Family Science Night is an official event of the 2018 North Carolina Science Festival presented by the Biogen Foundation. Family Science Night will incorporate the theme of “The Science of Food and Drink” and will provide participants with an easily recognizable connection of STEM (science, technology, engineering, math) to their everyday lives. We will have a variety of fun and engaging science related activities, targeting different age groups and different interests. At least four of the activities will be led by a subject matter expert in a STEM field, allowing for an informal exchange of career information. A few examples of the stations available include Walking on Eggs (you literally get to walk on real eggs! ), Putting the Pop in Popcorn (eat your results! ), Do-It-Yourself DNA, Banana Piano, Growing Gummy Bears, and more! In addition, as part of the NASA@ My Library grant, Family Science Night will feature a cosmic cuisine station, where attendees will get to sample and learn more about space food. The NASA@ My Library project is led by the National Center for Interactive Learning at the Space Science Institute. Partners include the American Library Association (ALA) Public Programs Office, Pacific Science Center, Cornerstones of Science, and Education Development Center. NASA@ My Library is made possible through the support of the National Aeronautics and Space Administration (NASA) Science Mission Directorate as part of its STEM Activation program. The event will be free and does not require registration. Attendees will be able to engage in the STEM activities they want to do from among the different stations available. As an official 2018 North Carolina Science Festival event, Family Science Night is among hundreds of community-based events that are showcasing STEM (science, technology, engineering and mathematics) activities for the citizens of North Carolina. The North Carolina Science Festival is presented by the Biogen Foundation and produced by Morehead Planetarium and Science Center at the University of North Carolina at Chapel Hill. For more information, visit www.ncsciencefestival.org. For more information about Family Science Night, please contact the Macon County Public Library children’s desk at 828-524-3600 or email maconkids@fontanalib.org. Through funds from Fontana Regional Library Headquarters, the Marianna Black Library recently purchased an automated external defibrillator (AED). Here are staff receiving training on how to use the device from Brooks Wolfe of the Nantahala Outdoor Center’s SOLO Southeast. AEDs are also available at the FRL libraries in Jackson County. As reported in the Winter Fontana Flyer, during a report to the Swain County Commissioners in October, a discussion ensued in which the New Library Planning Committee and the commissioners agreed that it was time to appoint a member of the commission to the planning team to act as a liaison between the two groups. We are happy to say that Swain native, Danny Burns, volunteered to join the team and was appointed last November. After attending his first meeting with the planning committee, Burns said, “I’m really excited to be working with this group. I learned a lot during just one meeting and feel that I have something to contribute to the project, as well.” Burns, who is retired from Pepsi-Cola, has been a Swain County Commissioner since 2014. Each year our libraries commemorate Dr. Martin Luther King in January and Black History Month in February. Hudson Library combined these two and intertwined them with Civil Rights in a multi-faceted display of books, films, and other memorabilia celebrating Freedom Summer, Black Lives Matter, Dr. King, Black Panthers, Malcolm X, President Barrack Obama, and much more. Fontana Regional Library’s Board of Trustees held its annual retreat in February at Southwestern Community College in Webster. They were joined by members of the local Library Boards, Friends of the Library, and Library management staff. Two members of the State Library of North Carolina Library Development team led this year’s retreat. Tanya Prokrym, Director of Library Development, and Amanda Johnson, Consultant for Data Analysis and Communications, presented background on library statistics and data. The goal was to help board members gain a greater understanding of data pertaining to libraries. Board members are regularly presented with statistics by library staff, read about library usage and trends in a variety of sources, and see demographic and other data compiled by county administration. The retreat gave board members some tools to interpret data, put it in context, and ultimately, understand how to effectively use this knowledge to advocate for the library. It’s hard to imagine running our libraries without volunteers. The services volunteers provide are valued and valuable. In fact, most of the libraries in the Fontana Regional Library system were established by volunteers. Volunteers continue to be essential partners in making our libraries the heart of our communities. With the help of dedicated volunteers, we can achieve our mission of providing excellent service and convenient access to resources that will meet the needs of those we serve. The library belongs to our communities and everyone in them. National Volunteer Week is April 15-21. This is a perfect time to think about volunteering at your local library. We hope you’ll enjoy sharing your time, talents, and skills to help enrich the lives and inspire the future of people using our libraries. The 7th Annual Friends of the Albert Carlton-Cashiers Community Library Chocolate Cook-Off was once again a resounding success. With delicious entries from the entire community, everyone who attended was a winner. One especially captivating centerpiece was this hand poured and painted sugar and chocolate fantasy. The talent and creativity of our community continues to amaze. Thank you again for all of your support and we look forward to next year. Assistant County Librarian Jessica Philyaw pictured with the library’s new baby grand piano. The instrument was purchased by the Jackson County Arts Council, who retain ownership, while Library personnel will administer its use in the Community Room. It is available for public performances, recitals, and community fundraisers on a first-come, first-served reservation basis. According to Arts Council president Gayle Woody, the Community Room’s excellent acoustics make it an attractive location for the piano, which she said has been on the drawing board ever since the new library building opened in 2011. For more information about the use of the piano, please contact the Jackson County Public Library.